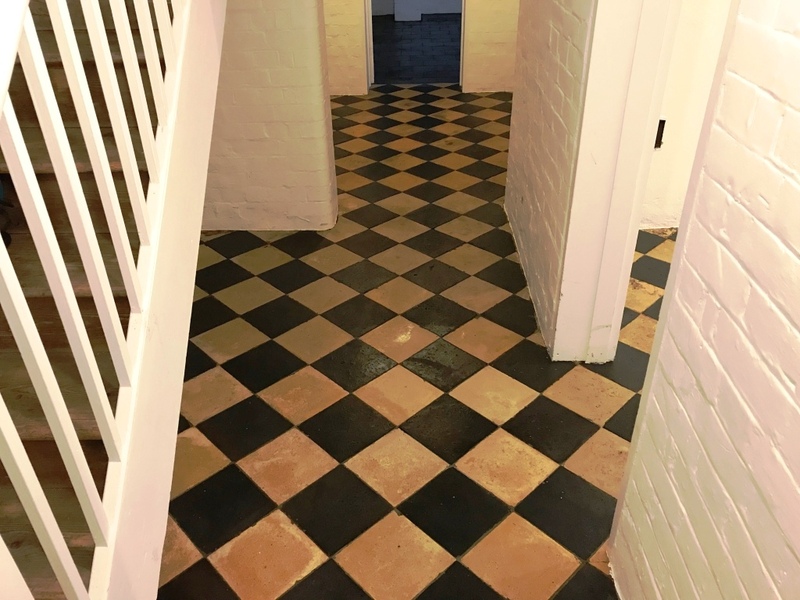 These Yellow and Black Quarry tiles are though to be original feature of this Victorian house in Reading and the owner was keen to get them renovated. 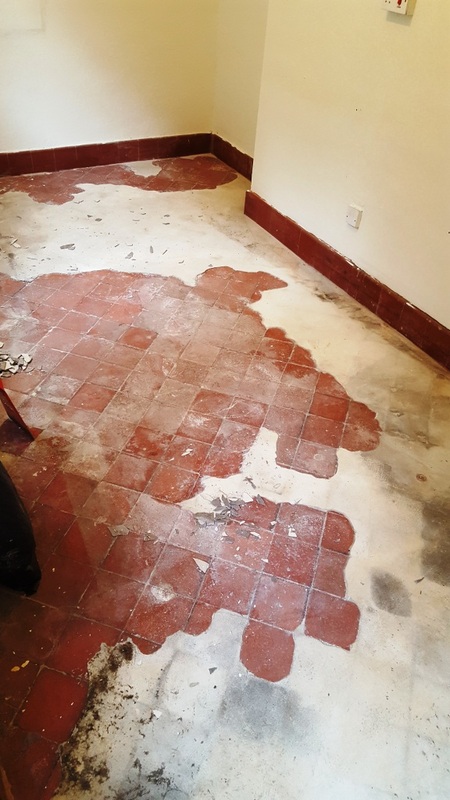 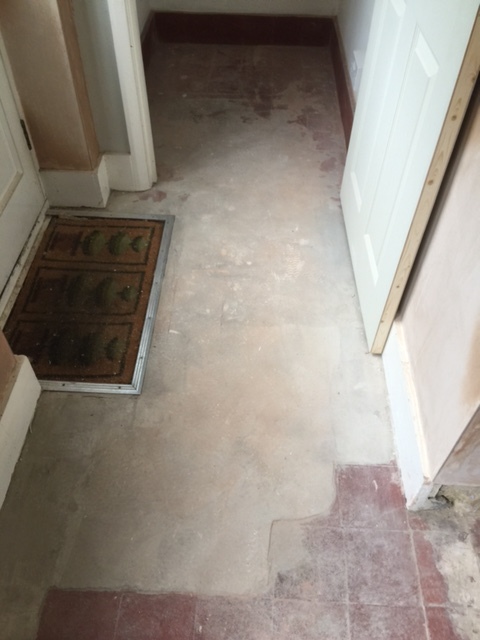 The tiles were in basement of the house and over the years the tiles had suffered from water damage due to various small floods, they were now heavily soiled and the most challenging task would be to remove a large build up of mortar and cement. 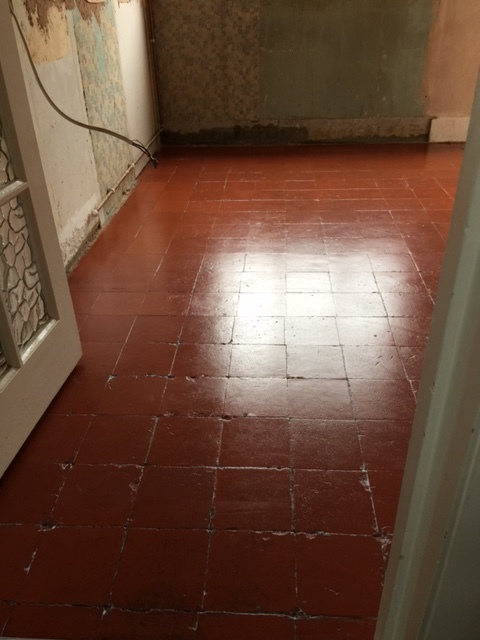 I ran a test clean in a corner of the smallest room to demonstrate the cleaning process and although confident I could significantly improve the appearance of the Quarry tiles. 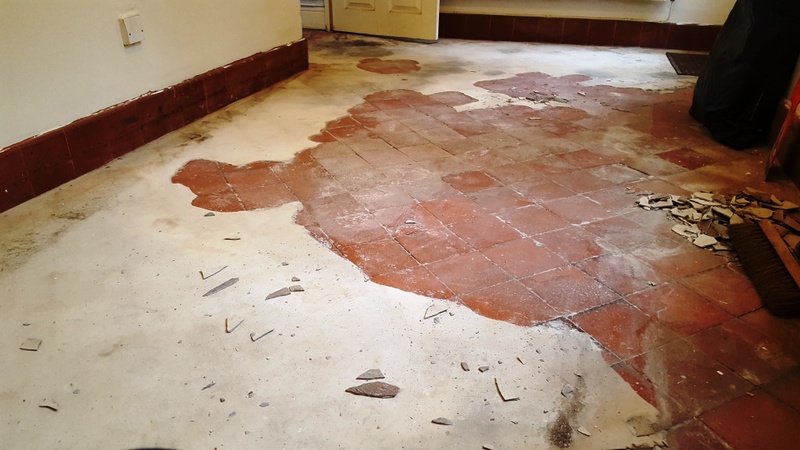 I had to explain to my customer that due to the years of neglect the outcome would not be perfect, however the test clean went well and the customer was happy with the outcome so booked me in to do the work. 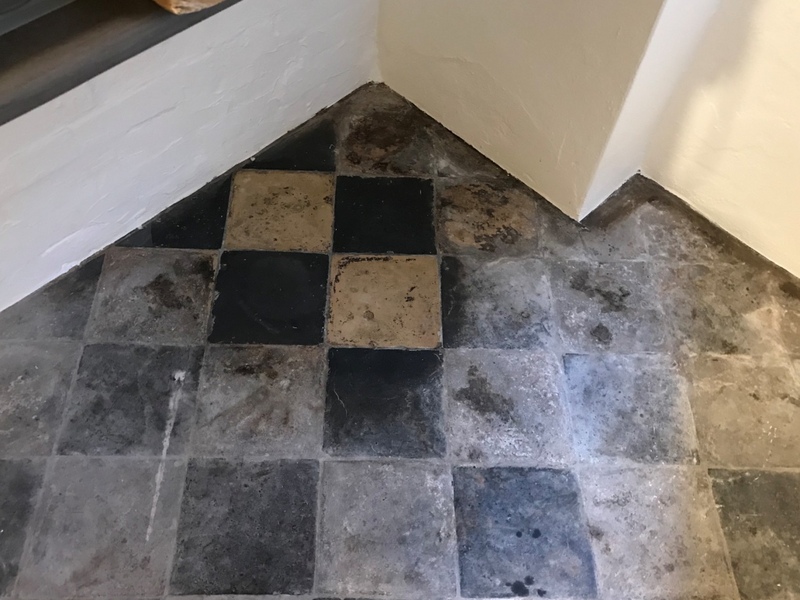 The first issue to tackle was to remove the dirt and ingrain soil which I did by scrubbing in a strong mix of Tile Doctor Pro-Clean which is a strong tile and grout cleaner. 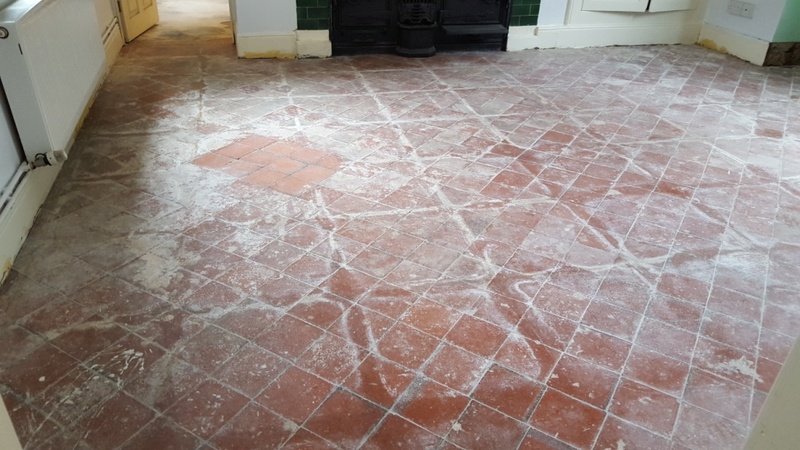 The solution was left to soak in before ten minutes before being agitated with a black scrubbing pad fitted to a rotary machine. 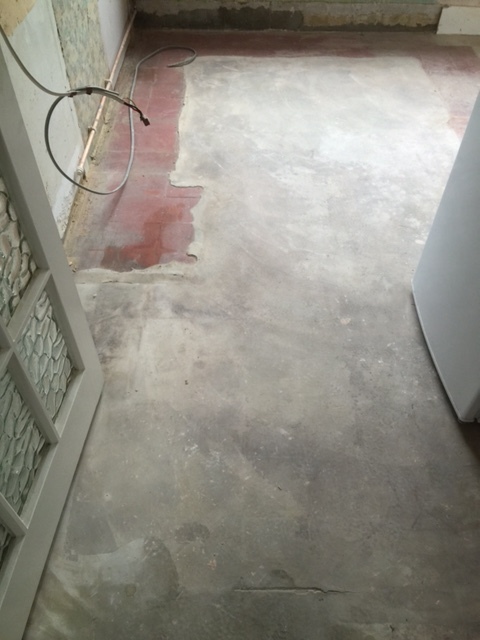 I then rinsed off the now soiled cleaning solution off using a hot water truck mounted extraction system. 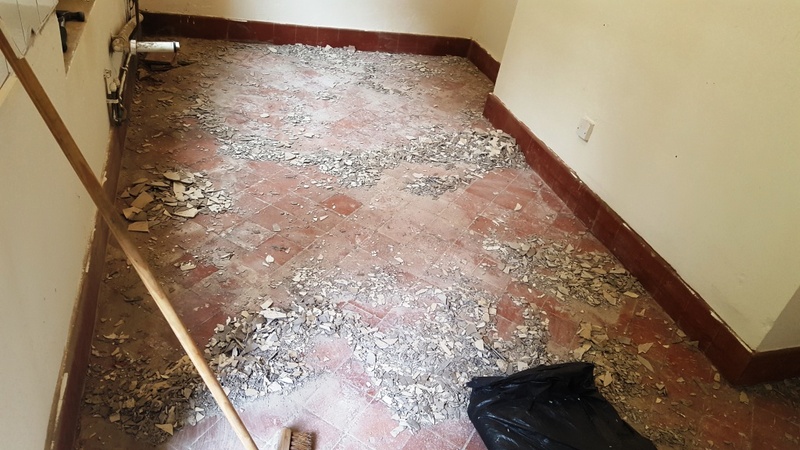 Now the ingrained dirt was taken care of, the most difficult task was to remove the cement/mortar built up that was covering a high percentage of the tiles. 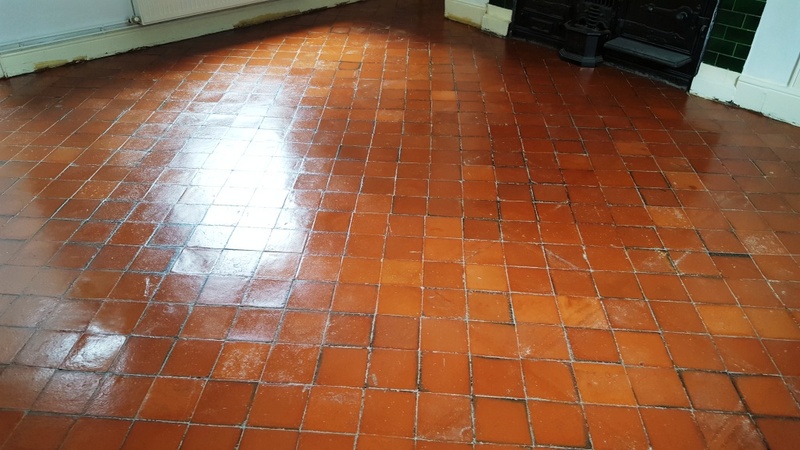 I did this using a combination of Tile Doctor products including Grout Clean-Up, Acid Gel and 50,100 grit diamond pads. 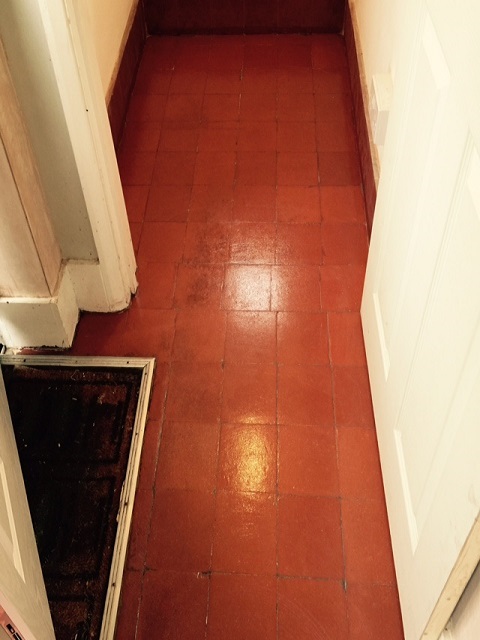 I started with Grout Clean-up but found that Acid Gel worked better on this occasion. 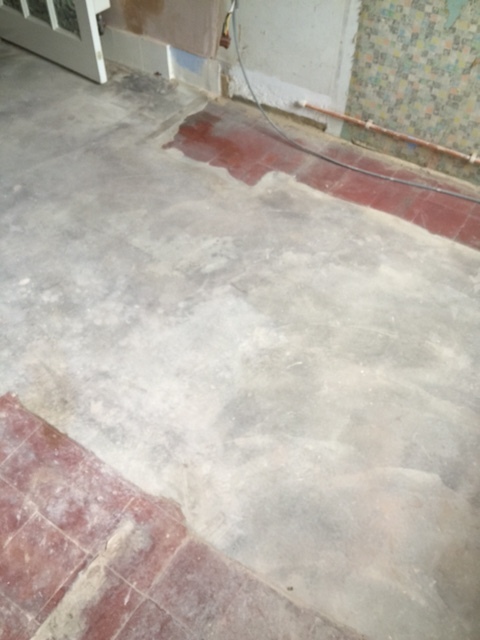 To deal with stubborn areas I left the Acid Gel to dwell overnight covered with plastic sheeting so it wouldn’t dry out. 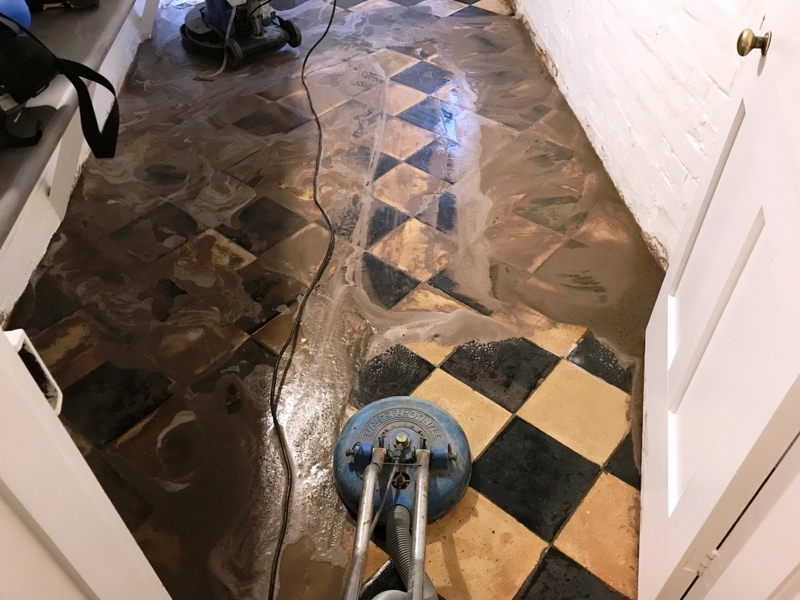 The Acid Gel worked wonders and I was able to complete the cleaning process when I came back the next day giving the floor another rinse with the hot water extraction system. 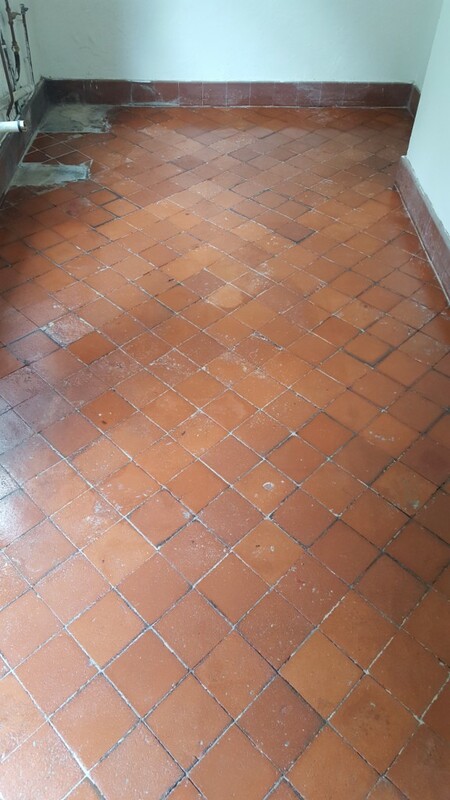 With the quarry tiles now clear I able to do a final spot check and used hand held burnishing blocks and very coarse 50 grit milling pad followed by a 100 grit diamond pad and another rinse to finish it off. 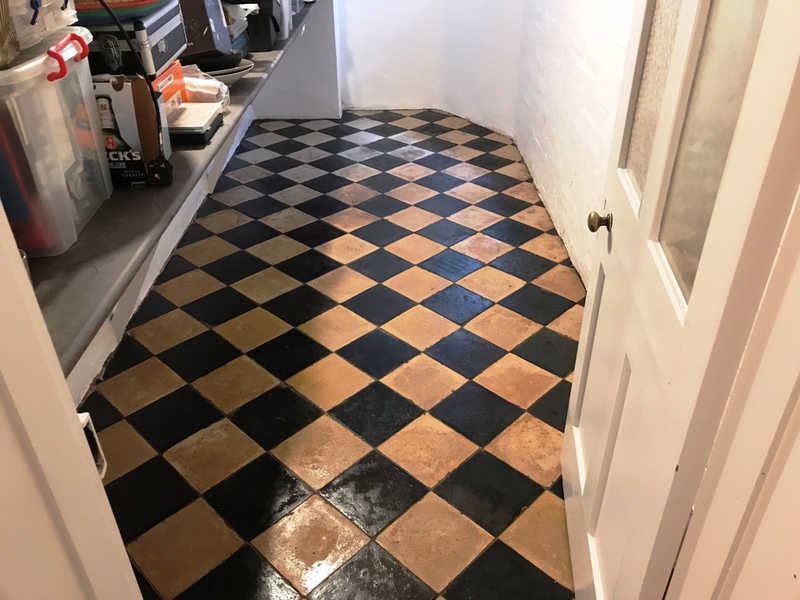 After leaving the floor to dry out over the weekend it was ready to be sealed. 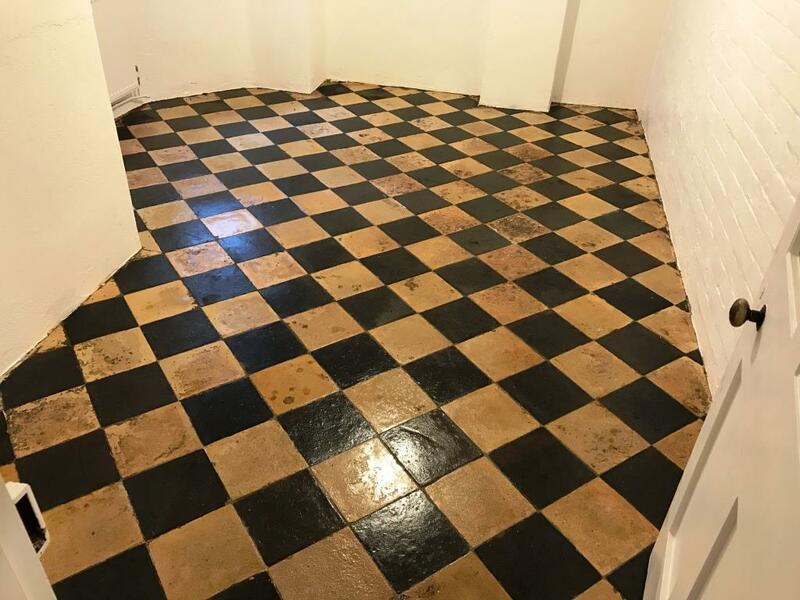 We had agreed on giving the Quarry Tiles a matt finish so I used three coats of Tile Doctor Colour Grow which is a fully breathable colour enhancing sealer that works well on old clay tiles. 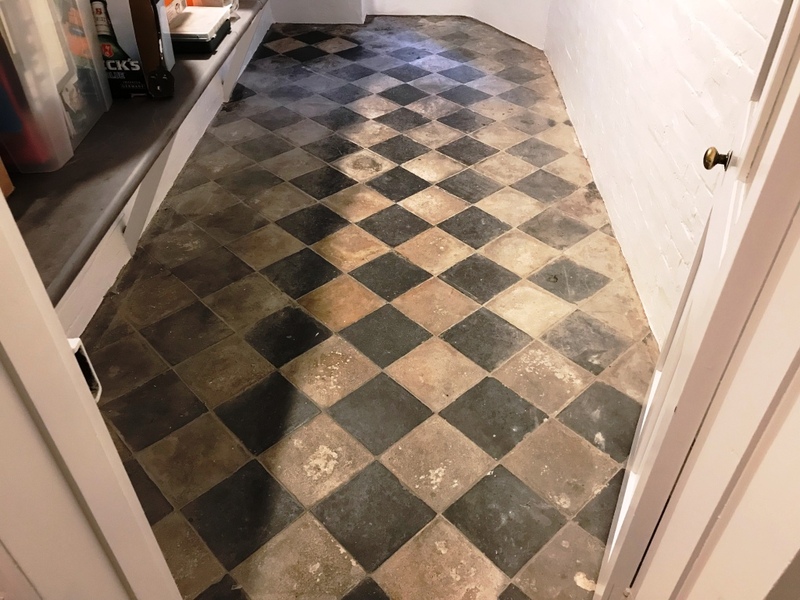 I’m happy to say the floor turned out very well considering its condition, certainly my customer was very happy with the outcome and left the following feed back on the Tile Doctor Feedback system. 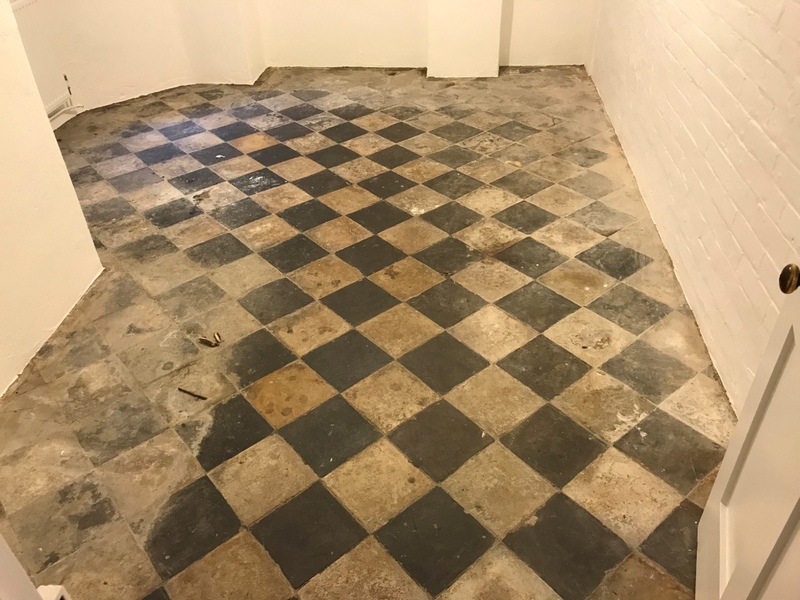 “Fantastic job – completely revived our Victorian cellar tiles, the before and after photos accurately show the difference the work has made! 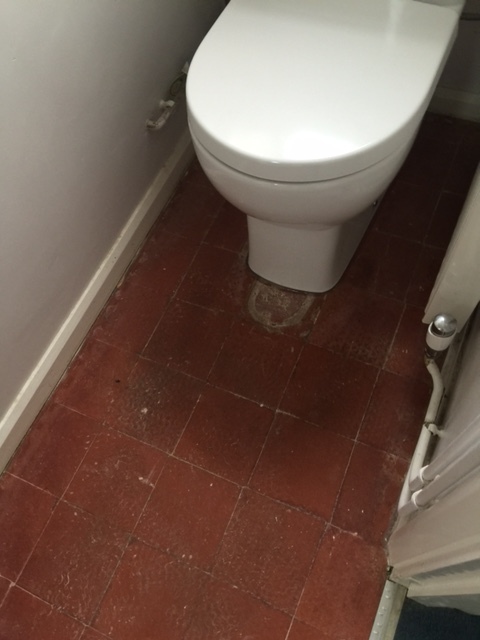 Also impressed by Dennis’s communication and responsiveness to our needs with the work”.